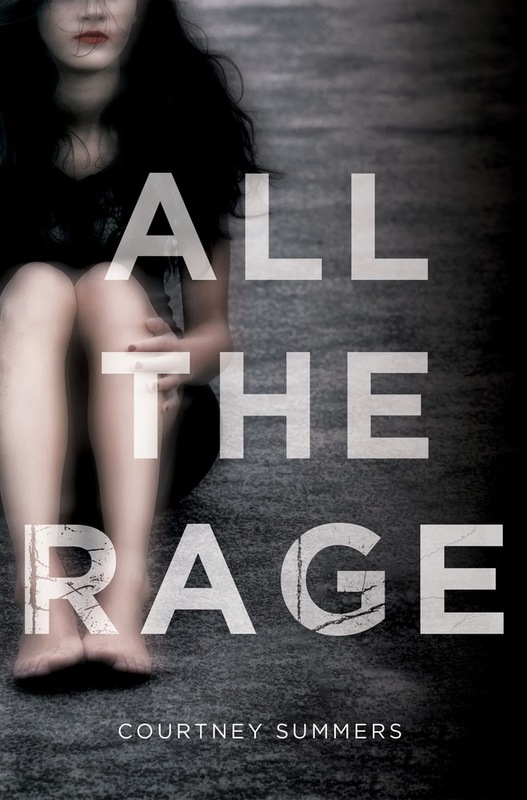 All the Rage by Courtney Summers. St. Martin's Griffin. 2015. Reviewed from ARC. The Plot: Romy is an outsider in her small town for so many reasons. Her father, the drunk; her mother, who married too young and just moved in with her new boyfriend. The new boyfriend who has never really held a full time job, living off government checks in the shabby house he inherited from his mother. And at school, Romy is known as a liar, a target for ridicule and mockery. She can escape to her work in a small diner, where people know her and like her and she doesn't have all the baggage of who her family is and isn't and what Romy did and didn't do. Where she can be herself; or at least, one version of herself. A version where people don't know about her and her family and her past. Until the day Penny, one of Romy's tormentors, shows up at her work and refuses to leave. The next day, both Romy and Penny are missing. Romy is found, with little or no memory of the night before. Penny is missing, and that just brings more torment to Romy because anyone looking for her meant they weren't looking for Penny. What did Penny tell Romy? And what will Romy do now? The Good: All the Rage is so good! It's a painful story because Romy's story is painful to read, but it's an important story because her pain, her anger, her age, her story is not unique. This is not an attractive look at a small town and it's inhabitants, in part because it is Romy's story and she sees the worst around her. Yes, her father is a drunk who got fired, but the story behind shows a man in pain who didn't know what to do. Yes, her parents were young teenagers when they had Romy, but her mother is a kind and compassionate woman who is doing the best she can for her daughter. The new boyfriend is actually an old friend of her mother's, who is kind and loving. These are people without much money, and with no power, but they love Romy. Romy had had a crush on a boy, back when she still had friends. The boy was popular and well liked, and his family was well connected in the town. And because she liked him, and dressed up for the party, because she wanted to be kissed, no one believed her when she said she said no. And so she became the liar, the outcast. Penny went from being a good friend to one of those siding against her. Until the day Penny came to see Romy. Romy is angry but trying to contain her anger, trying to survive it by going to work at the diner but that illusion disappears when Penny shows up, when her work-self and home-self can no longer be kept separate. Her anger is fierce and sad and lonely; it comes out in many ways. Upon learning that a friend has had a baby, her first thought is please, let it not be a girl. It is a girl. When she holds the child for the first time, she thinks of how hard her life will be, how hard a girl's life always is. Because all Romy can think of is how she was hurt and betrayed: how the price for having a crush on a boy, for wanted to look pretty, was to be called a liar who was trying to ruin a poor boy's life. Of course, both those things meant she had to have said yes to him; she could not possibly have said no. How can she not be angry and full of rage, to live in a world where the default view of a woman is that a boy has a right to her body, based on her clothes and her crush? My heart was broken again and again for Romy, for the pain she was in, for her isolation. For how the world turned against her, because it was easier to not believe her. Because not believing her meant that the world still made sense. Because it's not real until it happens to you. But Romy is one thing, besides being angry and full of rage. She's a survivor. She will survive, even if it takes time. She will survive, even if it takes her time to heal. And she's going to have hard choices to make, not only because of what happened to her, but also because of what happened to Penny. This is a Favorite Book of 2015. And I wish I could say more about Romy and her journey, and about Penny and what happened to her, but this is about getting you to read the book, and go on Romy's journey with her. Not to judge her. One last thing, but in a way an important thing: Romy wears red lipstick and red nail polish. She puts it on with care, with dedication. The lipstick and nail polish is sometimes to establish her identity, "I'm still here and real"; sometimes it's a protection, a wall of defense to hide behind; and sometimes it's armor, to give herself strength. I'm not much of a nail polish person, I go in cycles with using it (I have bad nails and little patience, not a good combination for painting one's nails), and this book made me dig out my nail polish, and to see it as something more than a way to be pretty. I hadn't thought of nail polish or lipstick in this way, either, until after I read the book. And now I can't think of it in any other way.